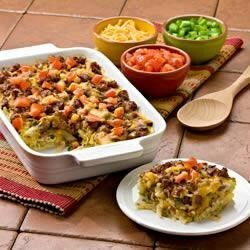 "Our Southwest Hash Browns and spicy sausage give this hearty egg bake real Mexican flavor. It makes a great brunch dish or easy dinner." Heat oven to 350 degrees F. Spray 8 or 9-inch square baking dish with nonstick cooking spray. In 10-inch skillet cook sausage and green pepper over medium-high heat 8 to 10 minutes or until sausage is browned and cooked through; drain. Place half of the Simply Potatoes in prepared baking dish. Top with half of the sausage and 3/4 cup of cheese; repeat. Combine eggs and milk in medium bowl; beat well with fork. Pour egg mixture evenly over layered mixture in pan. Cover with foil; bake for 45 minutes. Uncover; add chopped tomato and remaining 1/2 cup cheese. Bake, uncovered, for an additional 10 to 15 minutes or until knife inserted in center comes out clean. It was fair...not a family favorite. Very good. I used turkey italian sausage and added some chopped onion. Omitted tomato. Awesome is all I can say. I made mine extra cheesy.